Cathsoc is the Catholic Society on University of Bath Campus. They are a group of friendly students who meet every week to socialise, discuss issues and ideas, as well as worship together. 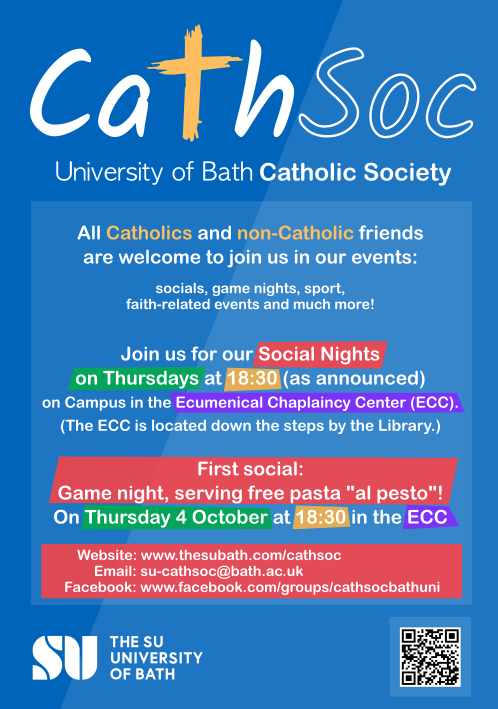 CathSoc is open for all U of Bath and Bath Spa students to join - whether you are Catholic or not, interested in religion, or are just simply looking for a friendly group of people to socialise with! They hold regular social events, usually involving food! Do sign up on bathstudent.com for the CathSoc membership, which is at £5/per year. With the membership, you’ll get to enjoy some discounts on events such as the Ceilidh, join them at retreats etc. and receive newsletters from them. To all you existing members, the committee request that you renew your yearly membership of £5. If you felt that you’ve grown spiritually, made great friends, enjoyed the chats and lunches after Holy Mass, or for any other reason, do renew your membership! This is a great help to Cathsoc’s cashflow to organize events.